Protest marches against the Vietnam war took place frequently in London - and other major cities in Europe and the United States - throughout the conflict. Often the demonstrations turned violent as crowds made up of students and other activists clashed with police. In London, the trouble in the late 1960s centered on Grosvenor Square - home of the US ambassador to Britain. Robert Newsom took part in the anti-Vietnam demonstration in London on 17 March 1968. I was a 24-year-old American reading English at Cambridge and went down to London to participate and watch the anti-war protest that began in Trafalgar Square and moved on to the American Embassy in Grosvenor Square. 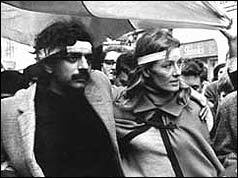 Along the way I took the pictures, among others, of Tariq Ali and Vanessa Redgrave, who were heading the march. I was surprised that I was able so easily to approach and photograph the lead marchers. I remember being terrified at being chased down by what seemed like scores of mounted police with truncheons flailing about while the square was blocked off so that none who found themselves on the inside could get out. But the police seemed as frightened as the protesters. I remember also seeing Mick Jagger standing coolly on the steps of a house in the square surveying the chaos. My friend Tim Hunt (a Research Fellow at Cambridge at the time - he has since won a Nobel Prize) caught him on film. I was 17 and a member of the CND. I joined the rally in Trafalgar Square where Vanessa Redgrave and Tariq Ali spoke. Afterwards, thousands of us convened on Grosvenor Square which was full of mounted police and riot police. Being towards the back of the crowd, as I approached the square, fighting had already broken out and I could see it was going to get really bad. Since I lived in Central London, I knew the area very well and managed to get out of the main throng and into safety. It was a very frightening experience, especially when the police horses stood on their hind legs as a result of being frightened or injured. I realised afterwards that I could have been seriously injured or even killed but it felt important to be there but not to put my life at risk. I was at that demonstration in the crowd on the south side of Grosvenor Square with my heavily pregnant wife. A policeman grabbed a long wooden chain necklace that my wife was wearing thinking it was a weapon. When he realised that it only "jewellery" and I told him she was pregnant he returned it. We were too far back in the crowd to see much of the action at the front, but the pushing was becoming potentially dangerous. The baby was born two days later, and is now a dentist in Dublin with two young children of her own. I still go on the anti-war marches and subscribe to CND. In 1968, as a Royal Engineer corporal based in Cove, Hants, I would hitch from camp to Coventry every Friday night, then hitch to London on the Sunday and catch the "milk train" that got me back to camp in time for morning parade on Monday. Hitching in full uniform guaranteed easy lifts, but that day (March 17th. 1968) it nearly cost me my life. As I emerged from the tube to get to the mainline station, I was confronted by crowds of baying protesters! My sapper uniform was like a red rag to a bull. An anonymous, but very plucky, copper grabbed me by the scruff of the neck and pushed me back down the stairs into the Underground. I never did find out what happened after my strategic withdrawl, but have always been very, very grateful to that copper! In retrospect one of the most interesting things was that the first time I saw "skinheads" was at the end of the demo - shaven-headed, waving American flags and picking off isolated anti-Vietnam demonstrators. I'd gone to the demo hoping it might trigger off something like the May Events in Paris but by the end of the evening realised we might have to fight off our homegrown fascists first.